Richard Grannon, a fellow youtuber who helps people heal from CPTSD/CPTSR, used the word “powerblind” the other day to describe people whose unprocessed trauma keeps them stuck in their old story, preventing them from moving forward. The metaphor struck me as RIGHT ON, and I ran with it. Whenever I think of Joy-Based Living, I envision people taking inspired action more and more frequently, and experiencing a continual expansion of their gifts while creating deeper and more meaningful connections with those they care for. 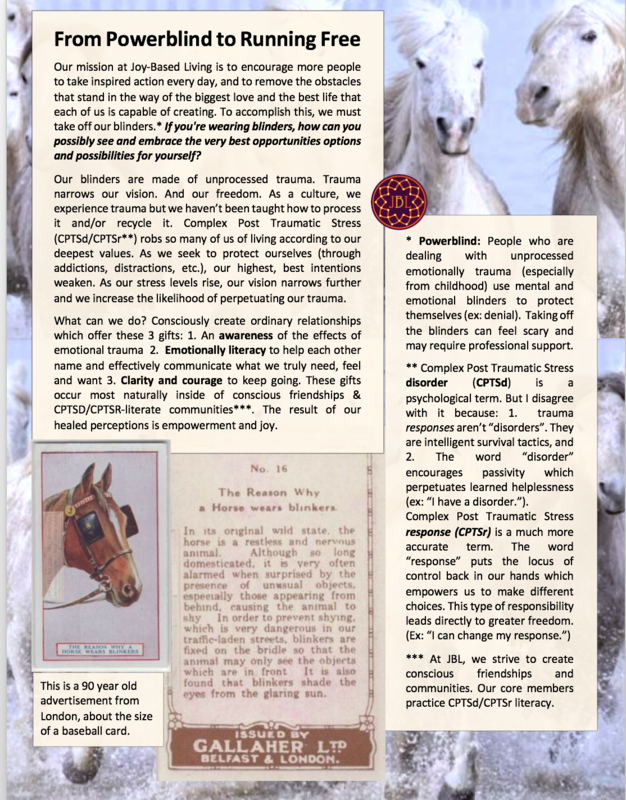 But – if you’re wearing blinders, if you’re dealing with sticky, unprocessed trauma, how can you possibly see or embrace the very best opportunities options and possibilities for yourself? Here is a poster that explains the metaphor… it’s still in an early stage but I wanted to share it with you here. I would love your thoughts.